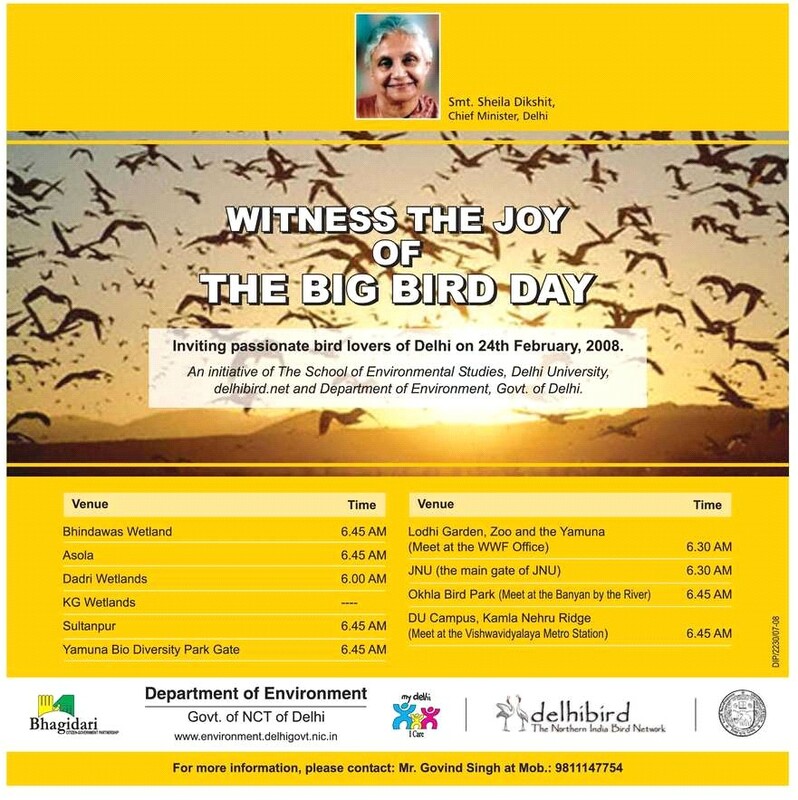 DelhiBird, in collaboration with the Department of Environment, Government of NCT of Delhi, WWF-India, the School of Environmental Studies, University of Delhi and several other environment related institutions and organisations, is celebrating 24th February, 2008 as the BIG BIRD DAY! The plan is to have a few teams start at different places in and around Delhi and then carry on to other places, in an attempt to cover the entire city. The idea is to record as many bird species in and around Delhi for the day. The tally would be of all the teams to see how many species we get collectively. Two years ago the count was 236, last year it was 188. Each team will start in the morning at a pre-determined place as per the list below. Anyone can join any team for the walk. From there the team would then go to the next place of their choice. In the evening the teams meet over dinner and discuss the day. 1. Birders can start as early as they want. 2. Calls are not to be included. A checklist has been prepared especially for this event by Bikram. He is also the official score and time keeper. DelhiBird is looking for other members to suggest places where they could start. And those who can’t join a team must still do some bird watching where ever you are and send us your list by the evening. And even those who could not get out in the day should still join us in the evening for dinner to hear the days account. Those joining the contributory dinner are to inform Wing Cdr. Vijay Kumar Sethi at Mobile 9810134504 so he can make the arrangements and book the place. The cost is Rs 350/- per head and the venue is Vishranti, CRPF Guest House, Behind VIMHANS, Nehru Nagar, Lajpat Nagar. Route: As you go towards Ashram from Lajpat Nagar, just as you cross the flyover, there is a turning to the left in front of the IOC petrol pump. Take the cut and turn left on the road parallel to the ring road. The road turns to right after 50 yards. Go straight. You will reach Vishranti, where the road ends. References are, DAV College and VIMHANS. It is next to Kamal Cinema. The office will be open from 4 PM. Snacks and soft drinks will be available. Those who want to freshen up there can do so before proceeding for dinner. Those who cannot come to the office can email their lists to biks@vsnl.com or biks.grewal@gmail. The lists can be faxed to 26109691. The deadline for receiving lists is 7 PM at the above address, after that please carry your list to dinner. ·    Suresh Sharma - Bhindawas (Meet at Bhindawas at 6.45 am. ·    Dr. Oswal/ Ranjit Lal/ Faiyaz - Yamuna Biodiversity Park. ·    Surya Prakash - JNU (Meet at the main gate of JNU at 6.30 am. Coordinator (Volunteer) for the day! This year, 202 species were counted on 24.2.2008 🙂 Quite higher than same time last year.